Over 40 original decorative bracket designs ranging from classic gingerbread to fun and whimsical. Manufactured from 100% durable PVC/Vinyl. Can be left natural white or painted to accent your design. 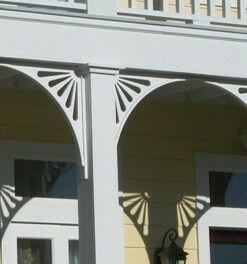 Painted Durabrac® decorative brackets are resistant to peeling, cracking, chipping and fading. Some designs include matching Gable Brackets.